Harrison Lord are specialist picture framers based in Brighouse, serving Huddersfield, Halifax, Leeds, Bradford and all of West Yorkshire. We make bespoke picture frames for all your treasured possessions including paintings, football shirts, rugby shirts, textiles (needlepoint, cross stitch etc.) and cricket, football, rugby and boxing memorabilia, and our London Poppy Frames. 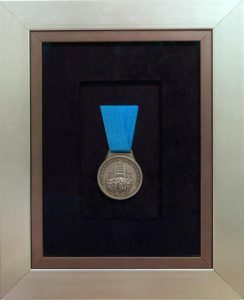 Established for over 40 years, you can be assured of picture framing that not only enhances the beauty of your art or other precious possessions but also preserves and protects them.We offer a full custom framing service which uses archival materials and techniques. We are continuously educating ourselves on the latest preservation techniques and materials, as well as keeping informed on the latest trends in home design and décor. We can frame almost any object, contact us to see if we can frame your bespoke object.